I will need to compact the stuff I have into a neat, organized work area. 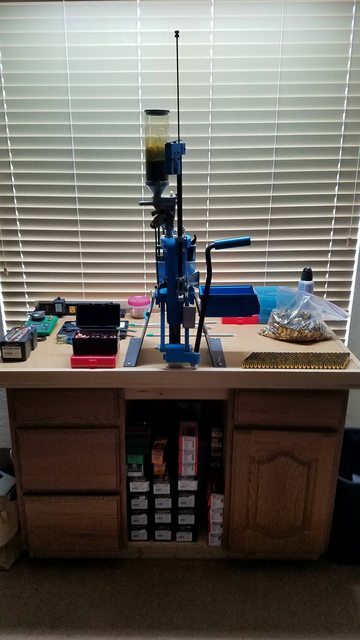 So help me out, and snap a pic of your reloading benches and organization ideas. I've got a Dillon 650 & two RCBS Rock Chuckers. I keep the Dillon on a Black and Decker Workmate that is mobile. I'm thinking of getting a tool box and storing my dies and stuff in it and placing the presses on the top (mobile and storage). It has improved a bit since this pic. I added small gooseneck halogen lights at each end, and got rid of that big silver light. It was good light but too much in the way. The light on the left end I can bend and direct the light directly onto the shell plate. And a few small tools (wire brushes, small ball peen hammer, etc.) are hanging down on the right, some from the end of the shelf and some on the wall. When not reloading, I use the free space for gun cleaning, battery charging, and other tasks needing just a bit of space. And I keep a RockChucker permanently mounted down on the right front corner. I keep the air pressure regulator dialed down to about 50psi, to keep from blowing stuff all over the garage. Cleaning the shell plate or a gun being cleaned does not require a lot. And the blowgun is variable pressure according to how much you squeeze the handle. Here is mine. Completely home made, including the top. Two oak vanity cabinets scooped up off Craigs List for 25 bucks. Maybe 20 bucks in plywood and masonite. I joined them together at the base, back and of course the top. I store all the bullets in the center. That keeps me from pulling it over! Gun powder is all on the right hand cabinet. Tools, cases, etc are on the left in the drawers. 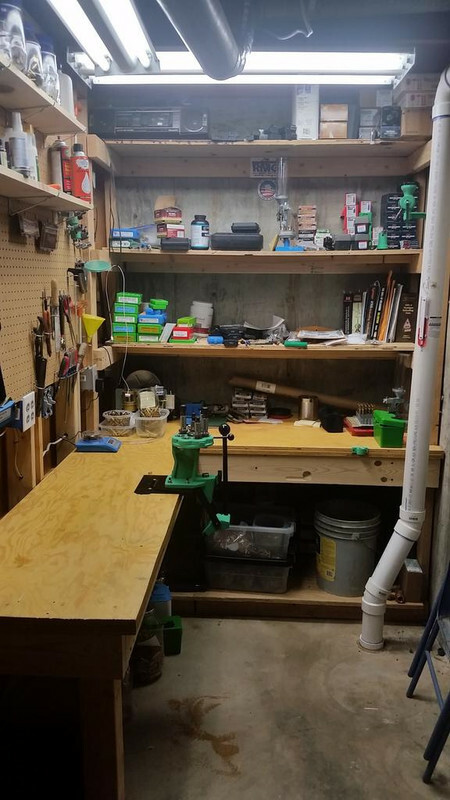 I keep my stands and tool heads on another shelf just off right, and my brass is on a large shelf to the left. Primers are at the other end of the room. I made an L shaped bench in the corner of my mechanical room. I am really liking the Inline Fabrication flush mount. I don't need separate locations for the presses, trim lathe and swager. 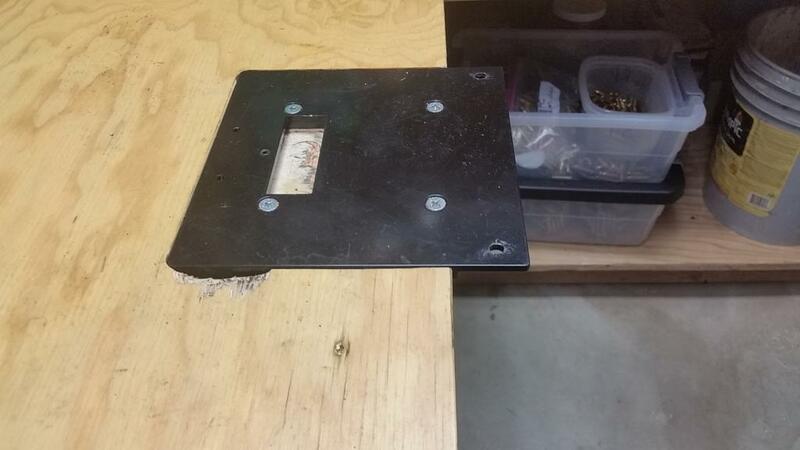 Cool plate for switching the machines out. Nothing fancy, just a little corner work area - everything on a single stage (I'm retired with time on my hands lol). stainless steel counter top in my garage, it just happened to be a perfect spot for this little set up, great place to store extra componets, helps when your a cabinetmaker by trade. now, if the builder would ever get done with my new house. XLT how do you organize the dies and stuff?? Yeah, I really like the Inline Fabrication mounts. 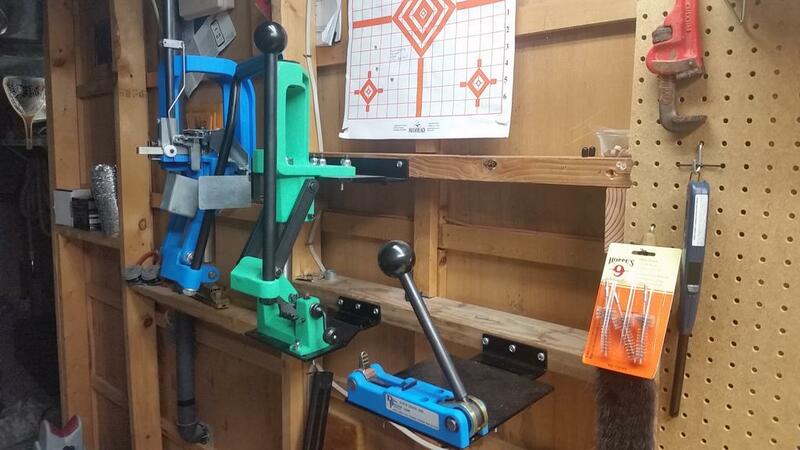 At first I had my Dillon 550B mounted on the short leg of the L bench. Then I got the single stage on the long leg of the L. Then I had to find a place to put the Dillon swager...too much stuff, not enough room. They also make a Ultramount(similar to Dillon's strong mount), but I didn't want me press sitting up that high. Good price, fast shipping. A no-brainier in my book!